USS George H.W. Bush (CVN-77), the 10th and final nuclear powered aircraft carrier in the Nimitz class is scheduled to be commissioned on January 10 during a ceremony at Naval Station Norfolk, Va. The aircraft carrier is named in honor of the 41st President of the United States, George Herbert Walker Bush. It is further interesting to note that the commissioning is to take place without completing sea trials, before President George W. Bush (the eldest son of the former President George H.W.Bush) demits office on January 20. The $6.3b ship built by Northrop Grumman was originally scheduled for completion in April 2008. The completion was delayed due to labor shortages, late material deliveries. After commissioning, USS George H.W. Bush will be initially home ported in Norfolk, Va., and assigned to the U.S. Atlantic Fleet to prepare for builder’s and acceptance trials. George H.W. Bush incorporates major improvements from her predecessors, including a bulbous bow, redesigned island, composite mast and three-wire arresting gear configuration. The first Commanding Officer of USS George H.W. Bush is Capt. Kevin O’Flaherty. The carrier will have a crew of more than 5,500 men and women, including embarked air wing personnel. The ship will support the F/A-18C Hornet and F/A-18E/F Super Hornet strike fighters, the E-2C/D Hawkeye Airborne Early Warning aircraft, the C-2 Greyhound logistics aircraft, the EA-6B Prowler and the EA-18G Growler electronic warfare aircraft, multi-role SH-60 and MH-60 helicopters, and other future carrier-based aircrafts. Here are some interesting facts on USS George H.W. Bush (CVN-77), from Northrop Grumman. USS Nimitz (CVN 68) commissioned on May 03,1975. USS Dwight D. Eisenhower (CVN 69) commissioned on October 18,1977. USS Carl Vinson (CVN 70) commissioned on March 13,1982. USS Theodore Roosevelt (CVN 71) commissioned on October 25,1986. USS Abraham Lincoln (CVN 72) commissioned on November 11,1989. USS George Washington (CVN 73) commissioned on July 04,1992. 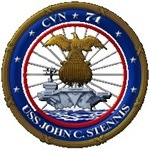 USS John C.Stennis (CVN 74) commissioned on December 09,1995. USS Harry S.Truman (CVN 75) commissioned on July 25,1998. USS Ronald Reagan (CVN 76) commissioned on July 12,2003. Here is the Fact Sheet on USS George H.W. Bush (CVN 77) as pdf document. More about USS George H.W. 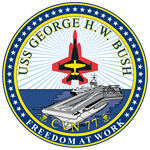 Bush CVN 77 are at Northrop Grumman, Pre-Commissioning Unit George H.W. Bush(CVN 77). Read more about commissioning from U.S.Navy. The commissioning ceremony in honor of the newest Nimitz-class aircraft carrier, USS George H.W. Bush (CVN 77), will be streamed live on Navy.mil at 11:00 a.m. EST Saturday, Jan. 10 from Norfolk. Read more from U.S.Navy. As a 21-cannon salute boomed and U.S. Navy fighter jets thundered overhead, President George W. Bush declared a nuclear-powered aircraft carrier named for his father, former President George H. W. Bush, will sail the globe as a potent symbol of men and women in uniform, past and present. Read more from U.S.Navy. Dozens of the former President George H.W.Bush’s shipmates aboard USS San Jacinto (CVL 30) attended the commissioning of USS George H.W. Bush (CVN 77) on January 10 which coincided with a reunion among the former Sailors. Read more from U.S.Navy. Here is the White House press release on commissioning. Here is the commissioning video clip of USS George H.W. Bush (CVN 77). Northrop Grumman Corporation, the ship builders have completed builder’s sea trials of the most advanced nuclear-powered aircraft carrier, USS George H. W. Bush (CVN 77). Read Northrop Grumman Corporation news release. USS George H.W. Bush (CVN 77) has successfully completed acceptance sea trials April 7-9 and is in final preparation for delivery. Now the aircraft carrier is ready to begin fleet service. Read more from U.S.Navy. U.S.Navy has taken delivery of its newest aircraft carrier, USS George H.W. Bush (CVN 77), from Northrop Grumman Shipbuilding on May 11. Read more from U.S.Navy. On May 19, USS George H.W. Bush (CVN 77) has successfully catapulted her first fixed-wing aircraft, F/A-18F Super Hornet and also first arrested landing. Read more from U.S Navy: Report 1, Report 2. Former President George H.W. Bush visited USS George H.W. Bush (CVN 77) on May 26-27 to observe flight operations during the ship’s underway period in the Atlantic Ocean. Read more from U.S.Navy.